Maybe you are planning to buy a portable sawmill and do not know how to use it most effectively. This short guide will help you to know all the small hacks that will save you time and effort. So, let’s start. Before you buy a portable sawmill, you need to choose the company upon that you have trust. You need to think about the necessity and use of the sawmill and which model and brand are the most appropriate to perform your task properly. 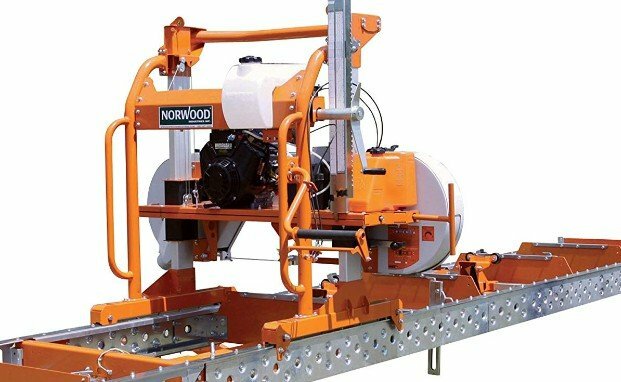 There are various kinds of portable sawmills namely bandsaw, chainsaw, and swing-blade sawmill out there in the market having various features. Fixing your priorities and choosing your model according to your need is the first thing to do. You need to also think about the power backup technology. Some portable sawmills use gas and diesel and some use electricity to work. Choose the one most convenient for you. While buying a portable sawmill, size really does matter. 55 cc with an 18” bar is minimum while something with 70 cc class with 20” bar is optimal. While setting up your mill, you need to have a cautious look at the wind direction. It is a very important task to avoid inhaling excess sawdust and exhaust fumes also. Before powering up your mill on for the first time, you have to make sure that each and every support are in proper place and in contact with the frame of the mill. Don’t forget to check the mill for the level. Install the blade in a way so that the teeth are pointed towards the sawdust exhaust. You need to sharpen your blades regularly to ensure maximum performance and precision. Before sharpening your blades don’t forget to take the top slab off your log. It will prolong the duration between sharpening. It is necessary to ensure good wheel belts of the blade to get the best performance. Dirt, rocks, and sand are enemy to the blade. Try to clean the log with a debarked. When it comes to blade speed, most of the portable sawmills are designed to ensure the best performance at full engine RPM. Yet, it is important to check whether it runs as smoothly as it should. Usually, a tachometer is used to ensure that the engine is running at optimum RPM. While handling blades, you should always wear leather gloves and be cautious. Otherwise, you may end up getting hurt. Lubricating after a certain period of time can increase blade life and will boost the performance of the sawmill. You should choose a good lubricant. If you want to use one of your choices, then you may choose straight water, pine-sol or Simple Green. As trees vary in density, it may be necessary to adopt the best technique to cut the trees easily. It is always good to have the log on the ground. This will stop any sideways movement. By the way, if you use skids, you have to make sure that they are big enough and have good notches. Leave the side cuts at the end of the board to stop the log from moving and sagging. If it is possible, try to angle the log on a downgrade slope. In this way, gravity will help to feed the slabber through the log. Thus, it can prevent both operator and engine fatigue as well. It is important to stabilize during double cutting. Try to leave a small uncut 5-millimeter ledge before making the finished cut. Cut the back-cut first. It will allow you to line up the second cut with a standard cut. You can easily adjust the winch up or down to line up the cuts, without having to walk around to the other side. When you are at the bottom of a slab, it is better to do the vertical cut first. While re-sawing, keep a tiny ledge on the log, placing the board to be re-sawn next to it. Double cut the board so that when pulled back, the blade forces the board and thus prevents any movement at the time of the cutting process. While started to cut a vertical board, adjust the board remover ensuring that it slides next to the board. While you proceed work a with a horizontal cut, stop any sideways movements of either the log or the mill. Try using three skids for bunk supports. It will help to stop the bottom slab from collapsing. You can easily make a pair of ramps. At first, cut an 8×8 beam. Then put it back onto the log and cut vertically in a normal way. Use these to help roll logs over your tracks easily. Feed rates are very important. It should be as fast as possible. Don’t waste water keeping it on while doing sizing. Never over-push your mill. You should rely on the blade to do the work. If you feel that you need to over-push, then possibly your mill requires an adjustment. Whether you use ceramic guides or guide rollers, make sure that you have a spare set to adjust and replace. Ceramic guides can break often and roller bearings can seize up by the passage of time. In every 25 hours, clean middle track oilers and lubricate track. In every 50 hours, clean and lubricate drum switches, chains, blade tensioner handle, pivot points, fittings, and bearings. Change the fluid in drive side cylindrical bearing and repack wheel bearings on axle once per year.